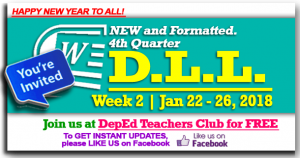 DLL UPDATE: Dear fellow Teachers, Week 2 – 4th Quarter – Daily Lesson Log (DLL) are now available. In the past quarters, we shared Daily Lesson Logs and other files that our Contributors have shared and are formatted by our Editors. We are now at the 4th quarter of the school year and we are really thankful to all our Contributors, Editors and Tech Volunteers. They are the foundation of DepEd Teachers Club. We are always grateful to them so we ask for your continued support. All of these files can be downloaded for FREE. Please keep on Sharing and Liking our contributions until all of our fellow teachers all around the country could benefit from this works too. May more blessings come upon us all. Thank you. New! 4th Quarter Daily Lesson Logs are now available. In line with the implementation of Republic Act (RA) No. 10533 or the Enhanced Basic Education Act of 2013, the Department of Education (DepEd) issues the Policy Guidelines on Daily Lesson Preparation for the K to 12 Basic Education Program. Planning lessons is fundamental to ensuring the delivery of teaching and learning in schools. These guidelines aim to support teachers in organizing and managing their classes and lessons effectively and efficiently and ensure the achievement of learning outcomes. Furthermore, these guidelines affirm the role of the K to 12 teacher as a facilitator of learning. Preparing for lessons through the Daily Lesson Log (DLL) or Detailed Lesson Plan (DLP) and provides teachers with an opportunity for reflection on what learners need to learn, how learners learn, and how best to facilitate the learning process. These guidelines also aim to empower teachers to carry out quality instruction that recognizes the diversity of learners inside the classroom, is committed to learners’ success, allows the use of varied instructional and formative assessment strategies including the use of information and communications technologies (ICTs). and enables the teacher to guide, mentor, and support learners in developing and assessing their learning across the curriculum. Content – The topic or subject matter pertains to the particular content that the lesson focuses on. Learning Resources – This part of the DLL asks teachers to log the references and other learning resources that the teacher will use for the lesson. The references include the particular pages of the TG, LM, textbook, and the additional materials from the LRMDS portal. The other learning resources refer to materials such as those that are teacher-made, authentic, and others not included in the references. Procedures – This part connects the lesson with learners’ prior knowledge. It explicitly teaches the learners how the new lesson connects to previous lessons. It also reviews and presents new lessons in a systematic manner. Remarks – This is a part of the DLL in which teachers shall indicate special cases including but not limited to continuation of lesson plan to the following day in case of re-teaching or lack of time, transfer of lesson to the following day in cases of class suspension, etc. Reflection – This part of the DLL requires teachers to reflect on and assess their effectiveness. In this part of the DLL, the teacher should make notes on the number of learners who earned 80% in the evaluation, the number of learners who require additional activities for remediation and those who continue to require remediation, the effectiveness of the remedial lesson, the teaching strategies or methods that worked well and why, and the difficulties teachers encountered that their principal or supervisor can help solve. To help our fellow teachers, K-12 Daily Lesson Log (DLL) files are now available for download. You can download the files easily. No Adfly, safer and faster. Just follow the links. God bless us all! We at DepEd Teachers Club are always grateful to all our File Authors and File Contributors. Credit goes to all of them. Let us all give them thanks and show our support for all their works. We are also thankful for all our File Editors, Sharers, Tech Volunteers and fellow Teachers for helping us and making this kind of service possible.